Most patios are installed in the back yard and are attached to the house, providing a beautiful outdoor sitting and entertainment area that is accessible without walking across the lawn. 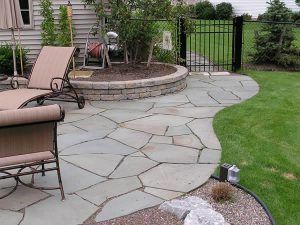 Before deciding on a location for your new flagstone patio, you should take into account the most unused area, and what angle would give you the most private from the neighbors (if you have any). It’s also a good idea to take into consideration how much sunlight / shade your spot has in the hottest part(s) of the day. One common mistake many people make when installing a flagstone patio is making it far too small. When designing the shape and size, don’t forget to take into account the amount of space a table and chairs will take up, especially if you plan on purchasing new ones. The patio doesn’t need to be a certain shape; abstract flagstone patios look beautiful with curves and flares. So, take a look at the surrounding area—do you see straight lines or curves? If you see curves, be sure to take the expanding and retracting areas into account when measuring the surface area to determine how much stone you will need. For more ideas, view our flagstone patio gallery, or contact Green Acre Sod Farm.